We offer a variety of Podiums / Lecterns from Spectrum Furniture and this post is made to describe and compare them. 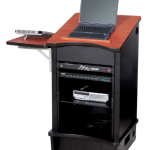 One thing that everyone notices about Spectrum Lecterns is that they are made with quality and durability in mind. All Spectrum carts have a metal frame and provide Rack Space for Audio Visual Equipment.